-Accommodates standard-size round, triangular and hexagonal graphite pencils. 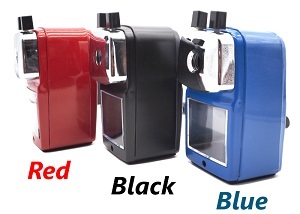 -Cutter is made of high quality durable alloy. -ABS material and friendly environment. -Two holes to choose. Small one is workable for wooden pencil's diameter within 8mm, big one is for pencil within 12mm. -The Sharpener is being designed that the thickness of pencil lead (0.6mm-2mm), special design for office and business use. 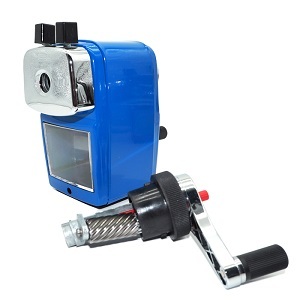 -Anti-slip handle design can easily use when rotate the hand crank. 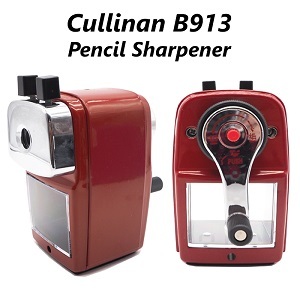 -When the pencil lead is broken during sharpening, make sharpener face down and press red button to take out pencil lead, no need to take out the whole blade.